If all else fails, I am highly qualified to furnish and design the waiting room in hell. because Dante seriously missed this one. This waiting placed me squarely on one of the forgotten lower circles of hell. In oncology offices, surgical offices, hospital rooms, the waiting exploded with unanswered questions that I couldn’t turn off. The intellectual side of my brain reminded me that most of the time, these things work out well. That 85% of all biopsies are benign. That everything is fine. But the emotional, irrational part of my brain reminded me that this could be it. The news could be bad. My life is going to change dramatically. There is no choice but to wait, and that battle played out each day like some kind of psychological smack-down. No one ever wins, though. Some days it’s gloom and doom. Some days it’s rainbows and lollipops. But the worst case scenario seems to have more points at the end of the day because maybe we are hard-wired that way. We assume the worst in a self-preservation effort. It gives us a false sense of preparedness for whatever will come. Waiting threw me into a black hole of uncertainty. I was Sandra Bullock spiraling out of control and nothing could set me back on course. So I did things to give myself some sense of control. I searched YouTube for videos entitled “Journey of a Biopsy Slide” or “What happens while you’re waiting?” I called my doctor and pissed off the receptionist with my daily “are those results in yet?’ question. I stayed up all night, staring at the ceiling. None of it did anything to stop the constant psychodrama going through my head. I thought I was losing my mind. Apparently, I wasn’t alone. 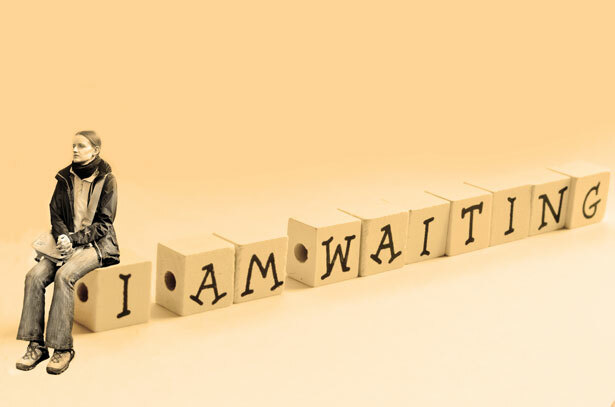 If you want to know how bad waiting can get, someone with Stage IV cancer told me that waiting for her results was worse than finding out the results. I found that hard to believe, but I suppose there is a sense of control with a diagnosis. There’s a plan. A protocol. The black hole ends and this time you’re in a wormhole traveling on towards some other course. Even though the destination might be grim, its better than flying blind. Right now, I’m flying blind again. Waiting on a plan for the rest of the year. But unlike the last few times, I’m not eager to get this news. I’m accepting the uncertainty, embracing the waiting like an old friend. After all, I’ve been here a few times already. True, I looked up all the worst-case scenarios. I researched all the drugs. All the side-effects. I’m still waiting for the call from the doctor, but I haven’t harassed his receptionist yet. Because at least now I’m not hurtling aimlessly through the black hole of the waiting room in hell. Now, regardless of what they say, I know where this leads to and I’m aiming straight for it. And as long as I know that’s the trajectory, the waiting just ain’t so bad. I”m a plan for the worse hope for the best kind of person and I think it served me well with the whole “cancer thing”. It helped me not to be blind sided by things. Some people want to know everything, some people just want to get through with as few details as possible. I think you’re probably one of those knowledge is power kind of people. I hope you are consistently surprised by how much better than expected everything is. We are waiting with you and praying for Besorot Tovot. That’s when the light bulb finally goes off and I say to myself, oh yeah! I must have gotten a little to cocky and forgotten who I was kidding. It’s just little old me, why should I be immune to life? Who says I’ve arrived? Clearly there are more Heights I have yet to experience, clearly my journey will be enhanced by this growing experience, I just have to dig down deep and finds its meaning and message for me. Because although I may not be as amazing as I would like to think I am certainly not a finished product yet. Whether this be my opus or just yet another hurdle to grow thru some one in this small universe thinks well enough of me to keep challenging, keep reminding me in alive and that I am the center of my own universe, so get up and live it. Rise to this new challenge as an opportunity. Or don’t. It’s all up to you, this is our choice to make. Live life or just get by, either way, it’s up to me. Take it. Leave it. We all have choices to make and consequences to live with. I choose to live, sometimes poorly, but always with an eye towards improvement. It’s just a matter of perspective. Adina, you remind us all, very poignantly, of this internal struggle we all come face to face with at some point or many points in our lives. Thank you for giving legs to the movement. Thank you for finding the words that we can all relate to but couldn’t articulate as succinctly as you did. Thanks for taking one for the team and keep reminding us of just how precious each and everyone one of us are. How unique we each are and how to keep on, keeping on with humor, dignity and above all our G-dly humanity. You are one of the special ones, and we know that thru your endeavors we all gain a little more strength, humility and direction. Keep your pen light going. We’re all growing from you. Thank you so much Kova. Your words, as always, speak to my soul. Missing you. Thank you for your beautiful and poinient words. I spent my entire pregnancy waiting for the final diagnosis, and can appreciate how the waiting was worse than the knowing. I will be 5 years cancer free in October. I am sending you lots of prayers and healing thoughts as you continue to fight. Stay strong. All my best. Thank you so much for your kind words! And congratulations on the five years!! WooHoo! !